There’s so many reasons to love Gran Canaria and the friendly locals are one of the most endearing! Spend a little time on its shores and you’ll soon see the openness and warm welcomes that have charmed LGBT holidaymakers for decades. It’s their laid-back attitude that has nurtured the thriving gay scene you’ll find today. 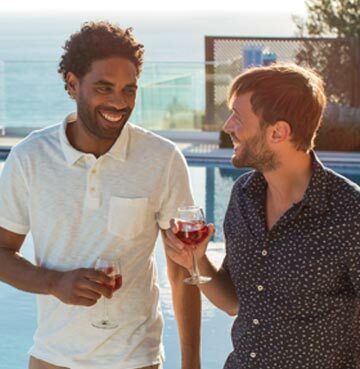 And why Gaydio recommends Gran Canaria as a top gay friendly destination. Picture carnivals with drag queen galas, colourful celebrations of the LGBT community and lively nightlife. And that’s just scratching the surface! Rugged mountains, golden beaches and cities packed with culture are just waiting to be uncovered. Sink your teeth into our guide to gay friendly Gran Canaria and start dreaming of its welcoming, exotic shores. You’ll be pleased to hear that Gran Canaria hasn't rested on its laurels! It may have built a strong reputation, but it’s always adding more to its gay friendly appeal. Winter Pride Maspalomas is the perfect example, recognising that LGBT holidaymakers flock here throughout the year. Launched in 2014, it’s already staked its claim as a key date on the LGBT calendar. This is winter, but not as we know it! November average temperatures sit at 25 °C, giving you that perfect dose of vitamin D. Picture a 10,000 strong Pride Walk, outdoor events with star studded musical performances, foam parties and so much more! Winter pride is your perfect sunshine pick me up, during those dark and gloomy November days back home. The winter celebration is also the perfect complement to May’s Maspalomas Gay Pride. 10 action-packed days, where you’ll mix and mingle with friendly locals and like-minded holidaymakers. There’s nowhere better to let your hair down! The lineup of events here is a rollercoaster of non-stop fun. Make a splash at a pool party, head out on the open ocean for a boat excursion or save up all your energy for Maspalomas’ mammoth Pride March. And then there’s the Carnaval de Las Palmas – a huge splash of colour on Gran Canaria’s LGBT calendar. The highlight has to be the Drag Queen Gala. So popular that there’s now a qualifying round prior to the event itself! Celebrating its 20th anniversary in 2018, the Drag Queen Gala is testament to just how long Gran Canaria has been celebrating diversity. The beauty of Gran Canaria is that there’s a lively buzz around the island all year long! You won’t find the locals retreating into their shells once the Pride celebrations are over. Fun loving Gran Canarians mix seamlessly with party-loving holidaymakers – the perfect ingredients for a colourful nightlife cocktail. And there’s something for every taste. Whether you love to sit back and take slow slips, or enjoy lively flavours as you dance the night away. The Yumbo Centre is the hub of Gran Canaria’s gay scene, home to some of the island’s finest bars and clubs. If your dancing shoes are the first item popped into your case, Bar Mykonos is ideal. The party here goes on into the early hours. Terry’s show isn’t open quite as late, but more than makes up for this with the entertainment it packs in. Take in a drag show and enjoy an evening that’s a little more laid-back. Sparkles Show Bar feels like the Goldilocks bar between the two. Those of you who want a little of both will find drag, karaoke and chances to dance. And you’ll find more than three bears at Bärenhöhle, the ‘Bearcave’ is a welcoming bar that offers happy hour drinks and a lively atmosphere. 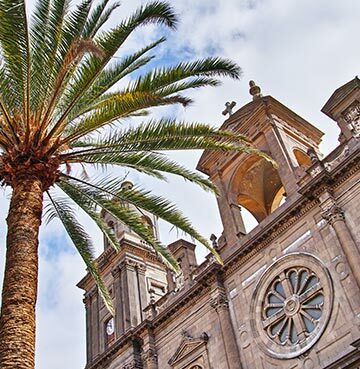 Exploration, relaxation or maybe just a little culture, Gran Canaria’s jam packed with amazing sights and spots to visit. Do you love long days on the beach? Recharging your batteries and soaking up the sun? Expect to be charmed into the little coves and bays tucked away on the coastline. Towering cliffs offer privacy and seclusion, giving you the peace and quiet you crave. Playa Taurito is a beacon of coastal tranquillity, sparkling away among the rugged cliff faces. There’s vast stretches of golden sand too, perfect for those who love a little space. 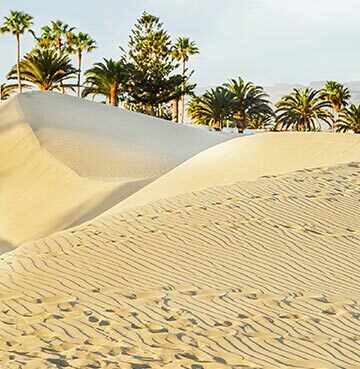 And there’s nowhere better than Maspalomas, where the beach merges seamlessly with the National Park’s golden sand dunes. Flanked by the sparkling blue waves this is a just a snapshot of the vibrant Canarian colour found along the shore. Maybe a leisurely stroll through the dunes just isn’t active enough? You might be arriving on Gran Canaria’s shores with plenty of energy and hiking boots in hand. The good news is that if there’s one place your boots were made for walking, it’s here! You’ll often spot the Roque Nublo towering over the rest of the island, so why not set a course? This 80m high lava plug offers a fairly challenging hike, but the views from the top will soon soothe your tired legs. Imagine how great you’ll feel when you reach the highest point on Gran Canaria! 1,813m above sea level, you really will be up in the clouds at Roque Nublo. Hoping to sprinkle a little culture over your Gran Canaria adventure? Las Palmas needs to head to the top of your list. The capital city feels like a treasure trove of winding streets, bustling squares and historic delights. And Vegueta is certainly the jewel in its cultural crown! The Old Town is just that, the oldest part of Las Palmas and home to its original settlers. Wandering through the streets is like a trip down memory lane. From the historic town hall to the striking Cathedral de Santa Ana, drink in all the amazing architecture as you go. Why not check out some of our other wonderful destinations? 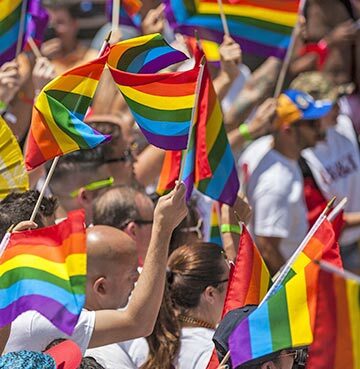 There's plenty more LGBT friendly fun to be had and amazing pride events in Orlando, Gran Canaria and beyond.